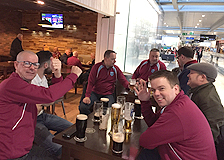 The first official Dublin Hammers Supporters trip to the London (Olympic) Stadium saw me arrive at the airport to find the lads at two different tables in the bar! 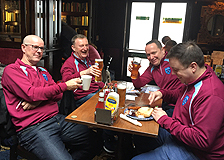 What’s this I thought, a split in the ranks, were one table the “Dublin Irons” group? It transpired that I was wrong and there was no need to be concerned – it was merely convenience due to our respective ages. 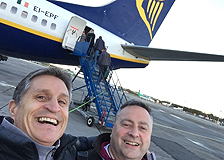 Anyway, spirits were high as we looked forward to our two day trip and with the flight on schedule, we boarded the Ryanair flight. All was quiet enough on the flight and after landing we made our way to the first traditional stop on these trips... the Gents toilet in the baggage reclaim area. 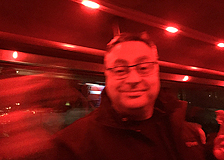 Then it was on to meet our luxury coach that was taking us to our hotel. 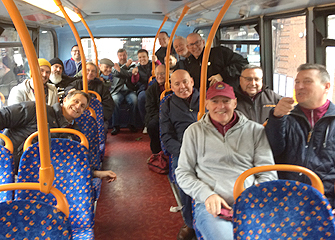 On the bus Travel Secretary, Tom Jones gave us all the spiel about the arrangements which was unusual as it’s normally the preserve of Liamo! We arrive at the hotel, deposit our bags and head off for breakfast in Romford where we met up with Josh. 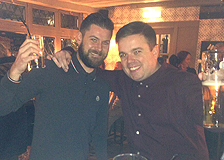 Two of the lads headed straight to the ground and phoned our Liamo with news of engineering works at Romford station. Liamo being the ever optimistic person he is proclaimed this a “disaster of biblical proportions”. Meanwhile Bad News consulted the one that knows everything, Google, and worked out the transport arrangements required... a 25 minute bus journey to Chadwell Heath followed by a 20 minute train ride. So after being heartily fed we head off to grab the bus – I’m not sure what the other passengers thought of us as we took over a third of the upstairs, but most of them had a laugh as the wisecracks were flying... Bad News Brennan got the biggest laugh when he pointed out that looking along the rows of seats was like looking at a box of eggs... with the rotten one at the top – we all knew which way the next two days were goiing to pan out after this remark! Onto the train and off to the stadium. Now I had been told that the stadium was terrible etc. etc., but I have to say I was mightily impressed and leading up to kick off the seats filled up to give a bit of atmosphere. 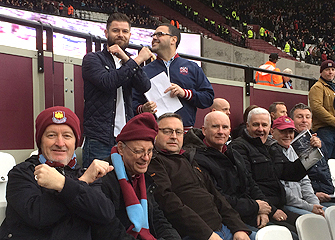 We were next to the Stoke fans who did what all away supporters do the world over... never stop singing. Anyway, the game overall was a disappointment. We looked sluggish and more afraid to lose the game than try and win it. I thought that leaving Kouyate at the back was a mistake as he is more influential in the middle of the park. Obiang played really well and I felt that Lanzini gave the opposition problems but overall we lacked a striker up front. Half time came and went and as we made our way back to our seats we had to produce our tickets. 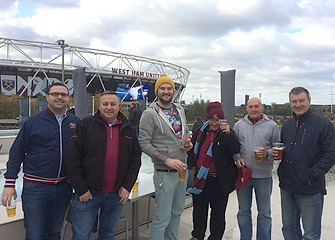 There is a crackdown on some supporters in and around where we were sitting over the Chelski game. I felt it was a bit OTT considering the CCTV, access control, seating allocation etc in the ground – all of these issues could and should have been sorted before the game. 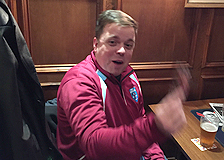 Thankfully they did let Galway Eugene aka Dr Jekyll and Mr Hyde back into his seat – honestly he has to be seen to be believed he gets so keyed up as soon as a ball is kicked! Second half livened up a bit and we enjoyed some good spells and eventually go 1-0 up courtesy of Antonio and a Glen Whelan OG. We go mad, the Stoke fans can’t believe it and suddenly the ground is hopping. We bring on Fernandes and Fletcher who did very well. 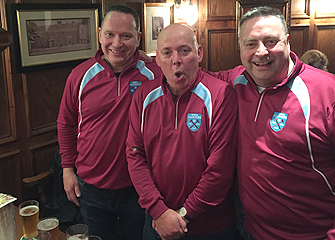 Our lead lasted just 10 minutes as Adrian suffered a rush of blood to the head, made a mess and Stoke equalise – we were devastated! The game ended up 1-1, it was poor stuff to be honest. 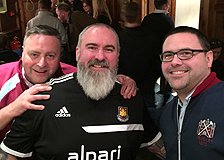 We all trooped off and met in a pub near the ground for a few refreshments and to watch the evening game on the TV. Bad News started his apprenticeship selling the Spot the Balls under the careful supervision of Dessie. 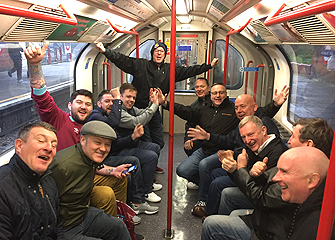 We had great crack in the pub and by the time we left (minus Big Owen) the journey home seemed shorter, especially as we got the courtesy bus laid on by British Rail from Chadwell Heath rather than the standard bus that takes the scenic route. Time for dinner and we went back to Wetherspoons en masse and enjoyed some decent grub. Back to the hotel to grab bags, have a wash and get ready for the night ahead. First stop the Golden Lion in Romford, which sounds better than it actually is – my main gripe is the difficulty in getting a drink in an English pub... none of the bar staff would last an hour in a pub in Dublin on a Saturday night! Anyway, despite us humming Madness songs at every opportunity, the resident band failed to take the hint and continued to play the stuff they knew. Gary tried to improve international relations with all and sundry and in particular three Pillipino girls who are probably still traumatised. 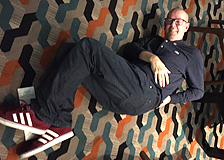 Last orders comes and goes and we eventually head to Yates nightclub where Gary throws some serious shapes on the floor – one of which included press ups! 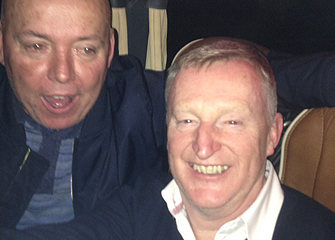 A great night was had by all except anyone else who wasn’t part of our company. The next day saw the DH crew surface at various times and head to Wetherspoons for another tasty breakfast. News filtered through that Chadwell Heath rail station was also closed for engineering works cue Liamo and the “Grey Cloud”. So we decided to watch the Gooners v Spurs game in Romford so the search was on for a pub with a TV, we eventually end up back in Yates, which looked decidedly different during the daytime. 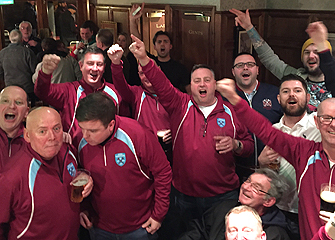 Once the match finished we headed for the bright lights of London. A noisy bus ride to Maryland where we jumped on the central line tube. The club Sec stationed himself by the door, ready to charge anyone €3 to come in! 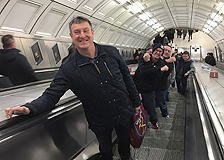 Gary looked for a Cinderella whose foot would fit the new WHU flip flops he bought in the Romford shop! Again we had a great laugh and thankfully some of the potential Cinderellas saw the funny side of things. We ended up as usual in the George to await the bus to take us back to Stanstead. This is where we saw the effects of the last recession, the Brexit vote and the onset of the ageing process for most of us as there was no beer or cider on the bus... new treasurer/travel secretary etc. required! 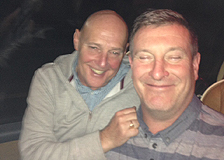 Refreshments in the bar in Stanstead saw Liamo fall off his chair twice, with help I might add. 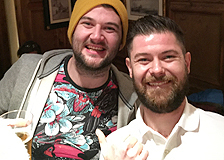 As usual Liamo declared his undying love for all of us... in fact the only thing missing from the trip was Fran’s rendition of “Human” and both Eddie Cox’s. The flight home was a quiet affair and I didn’t snore for once. It was a great trip with a great bunch of lads and I’m already looking forward to the next one.